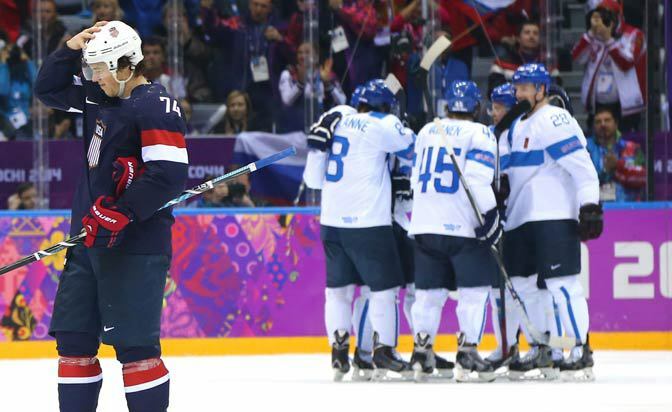 SOCHI – Less than a day earlier, the United States was on top of the Olympic hockey mountain. Twenty-two hours and two bitter defeats later, the Americans were left with clearly visible psychic scars and no medal. A comprehensive 5-0 victory by Finland on Saturday afternoon at Bolshoy Ice Dome delivered the Finns the bronze medal, the country's fourth podium finish in the past five Olympics. The Americans finished fourth, but it was not an accomplishment viewed with pride by a team that had designs on bettering the silver it won in Vancouver four years ago. "Coming into the final round I thought we were playing well," said forward Zach Parise, the team's captain. "I'm kind of embarrassed where we're at now." Where the Americans were at Saturday night was an almost unthinkable proposition when they faced Canada here Friday night in the second semifinal of the Sochi Olympics. They took the ice as the darlings of the tournament, boasting an offense that was running roughshod, averaging almost five goals a game in a tournament where offense has been scarce. They left the same surface 2 1/2 hours later as 1-0 losers. Their goal of gold was foiled. Their dream of exacting revenge on the Canadians, who beat them in ovvertime in Vancouver to win the gold medal. They were unfulfilled and angry. They invested everything in beating the Canadians. They had no reserves when it did not happen. "I think through four games in this tournament, our team had played very well, had some good victories," coach Dan Bylsma said. "I think the fifth game took a lot out of us, took a lot out of us emotionally. Getting back to that [level] in this game was not there for us. Actually, the United States was in the game Saturday for the first period. But a horrendous start to the second period proved to be the undoing of the Americans, causing the team "to unravel," in the words of their coach. Teemu Selanne opened the scoring with a goal at 1:27, turning a turnover by American forward Dustin Brown into a momentum changer. Then Jussi Jokinen scored off the ensuing faceoff on a play which saw virtually every American on the ice make a mistake. The team overpursued the puck in the defensive end and goalie Jonathan Quick was caught too far out of his net. Brown was benched after that sequence. He didn't see another shift in the second period and played 77 seconds in the third. It was another tangible, and jarring, reminder of the depths to which the team had plummeted in such a short span. The Americans were like a favored heavyweight being who was with a heavy punch from an opponent not expected to be in the same class. Reeling and a bit dazed, they never again found their rhythm. "Yeah, we did collapse," said defenseman Ryan Suter, one of the alternate captains. "We had a great first period, we were all over them, had a couple of good chances, couldn't get one by him and it ended up costing us." Not even a pair of Patrick Kane penalty shots could save the team on this day. Kane, who did not score a goal in the tournament, shot wide on his first attempt in the first period when the game was still hanging in the balance. The second, less than five minutes after Jokinen gave the Finns a two-goal lead, was even more cruel. This time, Kane had Finnish goalie Tuukka Rask beaten, but the rising wrist shot hit the post and clanged harmlessly away. "It happens. I had him beat clean on the second one, it just hit the post," Kane said. "But even with that, our effort was not good enough to beat those guys today." What to expect in Sweden vs. Canada? After the second penalty-shot miss, the Americans pressed desperately, but not intelligently. for the equalizer. Instead, they drew penalties with their aggression and took chances that left them open to an incisive counterattack by the Finns. The deficit mounted and the frustration grew as the seconds ticked away. There was to be no saving face on this day. "I have to say I think the USA has maybe the best team in this tournament," Finnish coach Erkka Westerlund said in the post-game presser as his counterpart, Bylsma, was being questioned about what happened to his team. "They play well together. It wasn't an easy game. We had our momentum, but USA as a team was maybe the best team in this tournament." The well-meaning words from the Finnish coach did not serve as the intended salve. Instead, they scraped the raw wounds open further, reinforcing to the Americans how promising this tournament had been 24 hours earlier. Reinforcing the notion that this was a team capable of winning gold. "It feels like you played this tournament for nothing," forward Blake Wheeler said. "You win that quarterfinal game you get excited because you know you're going to play for a medal and you come away with nothing. Not much to say, just disappointing; sour I guess. A medal's a medal and it's going to be with you forever and we couldn't come up with one and that's the part that's most frustrating." It's also the part that will stick with every one of the American players as they wait to return to North America and restart the NHL season with their club teams. "It's an opportunity lost, quite honestly," Brown said. "It's not too many times you get an opportunity to play in the Olympics. It's not how we wanted it to go."